Another interesting day for the euro vs dollar, as the trading session ended with a wide spread down bar, which breached both the 9 day and 14 day moving averages. Once again the forex pair failed to push higher and break above the 1.44 price handle which is now taking on an increasingly significant role, for any sustained push higher. 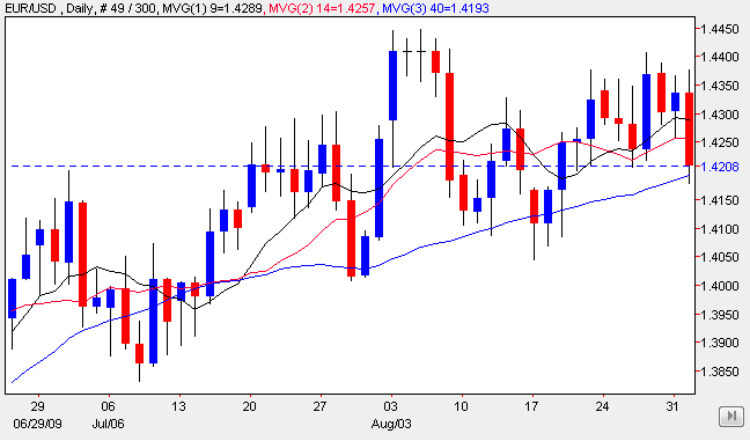 However, before we assume that the euro vs dollar is likely to fail at this level, it is interesting to note that the 40 day moving average, which once again provided the key support level yesterday, preventing any further fall. This is a technical feature of the daily chart that now seems to be being repeated, and to date has occurred 3 times in the last month, with a subsequent bounce higher as a result, so it would be no great surprise to see the same effect again today. The main piece of fundamental news today on the economic calendar started in Europe with the revised q/q GDP numbers which came in on target at -0.1%. At the same time the PPI data for the whole of Europe was also released and which came in at -0.8% against a target of -0.5%. The latter number has a more muted effect as the market tends to react to the individual German and French numbers. However, today’s figure does point once again to the fact that deflationary pressure continues to persist in Europe. Later in the US we have the release of the ADP figures for employment, which although is a relatively new indicator, nevertheless can provide a good guide to the more significant NFP results due for release on Friday from the Labour Department. The numbers are based on increases or decreases in payroll figures during the month, and therefore provides a solid base for analysis of the employment market trends month on month. The forecast for today is for -250,000 against a previous of -371,000, once again reinforcing the view that the worst of the recession may be over. This release is accompanied by two other more minor employment numbers: the revised Nonfarm Productivity q/q & the revised Unit Labor Costs q/q. The day ends for the US with the m/m factory order, crude oil inventories, a speech from FOMC member Lockhart and release of the minutes from the most recent FOMC meeting which can cause a degree of volatility in the forex market. All in all a day which starts relatively quietly but promises to end with a bang!